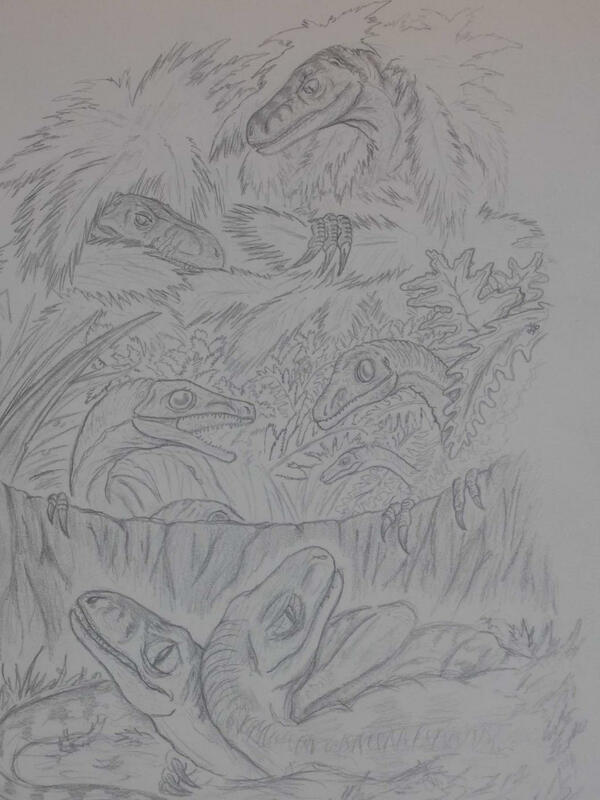 A pack of Compies have stumbled upon a Velociraptor nest and think the babies will make a quick meal, but mom and dad have just found them as well. The Compy on the left is asking the other: "Are you sure this is such a good idea?" Heh heh.. it's VERY likely that's exactly what is going on. Compys get into so much trouble..I love the little guys. Amazing. I reckon that in the time it takes for me to paint up one itty bitty thimble-sized dinosaur, you've already built yourself a life-sized one. From scratch. Now that fish took around 2 days..not bad really...but it didn't need much of a frame... hehe I also have a small Rhamphorynchus I'm considering doing while inside..could take a couple days as well. Just depends I guess.. lol Thanks again ! 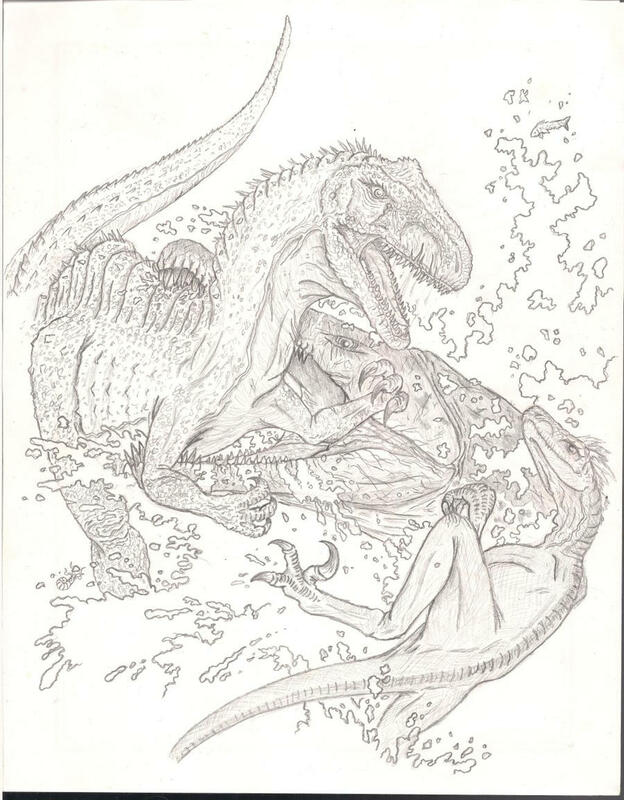 A scene from Raptor Red by Robert Bakker where Raptor Red herself is attacked by a large female Acrocanthosaurus. Remembering the large pliosaurs that attack from the sea earlier she lures the theropod out into the waters hoping they will go for the larger prey item....and they do. WOW man gotta luv them vivid colors you gave that Spino too man! He looks awesome! I am guessing it's a male since male reptiles has more textures than the females as color went It's really impressive man, how many do you have in your garden atm? I suppose a male makes more sense...he's not all grown up either of course. I figure there is some good reason for the color..my grandpa pointed out the other day he looks like a fishing lure. Let's see...I have 9 including babies and pterosaurs. Chris has a veritable Mesozoic Park of his own. I do really want to own my own Dino-Park someday..then I can have a seasonal Halloween event as well. Both my passions combined. Thanks ! Yeah they are a bit of hard work..but I love them...and can't stop making them..
we all have our obsessions it seems haha way cool man! I even have considered a Nothosaur, Plesiosaur and a Mosasaur at some point..but I need a BIG pond for them. Just landscaping a place to put small specimens of each would need to good sized. On my list this year is the Juvi Brachiosaur, an Allosaurus head, a Juvi Stego and maybe a new Dilo that is a lot more accurate. I need to do a juvenile Rex a some point as well..and maybe a Trike and Struthiomimus..maybe next year. Juvenile Brachiosaur framing continues. I would have accomplished more but it poured down rain here for awhile. And figure up dimensions from a scale model is a royal pain in the tail...pfff. I should be starting wire wrapping tomorrow or Monday.